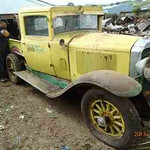 1929 Master sedan made into a salvage / wrecker by Bolton Bros Garage, Ongarue, NZ, in 1950. In storage 30 years. Sold for NZ$8,051. (US$6,850.) Oct. 2013.